and the type of equipment you use. Licenses are granted to either individuals or businesses. Through the licensing process, you are assigned specific frequencies to use on approved equipment. • LMR (licensed) Radios must be programmed with your licensed frequencies. • MURS (non-licensed) Radios come pre-programmed with MURS frequencies. • CB (non-licensed) Radios come pre-programmed with CB frequencies. (non-licensed) Operates in the 903-928MHz ISM band. We offer the Motorola DTR650 radio for businesses wishing to go license-free. (non-licensed) Service between low power hand-held radios, for individual, family, group, recreational and now includes business activities. Channels 1 – 7 and 15 – 22 must not exceed 2.0 Watts. Serious penalties and prosecution can result from the unlicensed transmission on frequencies which require a license, and/or interference with public safety transmissions. In the US, the FCC has divided the radio frequency spectrum into different sections called ‘Bands’ (such as HF, VHF, UHF). Bands consist of a range of frequencies. The FCC then assigns each frequency within the band to a 'Service' (such as CB, Amatuer, FRS, GMRS, Land Mobile, etc.). Some Services require a user to be licensed, and some do not. The following table outlines the common service bands used in two-way radios, along with a description of each. More detail on each band follows this chart. FRS UHF 462 & 467 MHz No 0 22 2 ³ fixed stubby No personal or business New changes to this service allow it for business. ³ Channels 8-14 must be ½ watt. + 8 repeater 50 any type Yes personal only Licensee must be 18 yrs or older. Anyone, regardless of age, can operate your radios. government Licensee must be 18 years or older. Also called PLMR. MURS VHF 151 & 154 MHz No 0 5 2 fixed* No mixed use Limited range. * External antenna up to 60ft to extend range. Marine VHF 156 - 162 MHz No * (see note below) 0 48 100 + any type N/A mixed use Only use marine radios. ³ All marine radios have the same pre-set channels & frequencies. ISM UHF 902 - 928 MHz No 0 1000+ any type yes mixed use Also know as 33 centimeter. Used for on-site short-range communications. Airband VHF 108 - 137 MHz Yes ¹ 760 8 aircraft & stations ¹ Only use airband radios. ³ All airband radios have the same pre-set channels & frequencies. No 40 mixed use All CB radios have the same pre-set channels & frequencies. Ham HF, VHF, & UHF Yes 10 yrs Yes Also called Amateur radio. 3 types of license: Technician, General, & Extra. Equipment must be certified for use within the band being used. For example, only use marine radios on the waterways, airband radios in the airways, etc. ¹ For Airband - License code is RR (Restricted Operator). No test is required, since certification is through your pilot certificate. See the FCC for more details. ² Costs can vary depending on the type of license. We offer several licensing packages. Click here to learn more. ³ Marine and Airband radio channels are configured for specific frequencies and uses. * For Marine - No license required for harbor and waterway. A license is required to operate in international waters. ** Most commonly used frequency ranges are listed for each service. For a complete list of frequencies please see the FCC.gov website. Frequencies 462.650, 467.6500, 462.7000 and 467.7000 MHz are not permitted near the Canadian border. 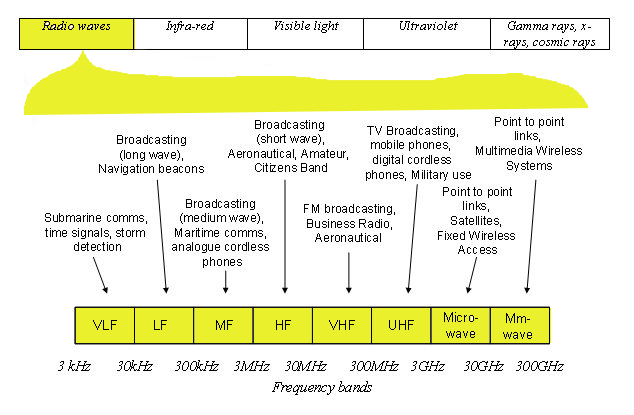 Below is a diagram showing the division of radio waves into bands, and which services are assigned each band. The FCC does not require a license to use the FRS service. Intended to be used by family and friends to communicate within short distances. Now for both commercial & persoanl use. Most consumer radios have both FRS and GMRS channels (see next section on GMRS). If you purchase a FRS / GMRS radio you can avoid the need for a license by staying within the FRS channels (usually channels 8-14). FRS radios are now authorized to use up to 2 Watts ERP (Effective Radiated Power) on FRS 462 MHz frequencies (FRS ch. 1-7). Frequencies within the 467 MHz range (ch. 8-14) now have the same technical limits that previously applied to FRS radios (½ watt with a built-in antenna). Can be used for business as well as personal use. All FRS radios must have a non-removable stubby atenna, so your range is greatly limited. GMRS is also for individuals and their friends and family. For non-commercial use only. Is a more powerful service for individuals than FRS (handheld radios can be up to 5 watts). GMRS does require a license. Refer to the chart for requirements. Equipment must be certified for GMRS use. See Getting a GMRS License for step-by-step instructions on obtaining a GMRS license. LMR is for use in business, government agencies, and non-profit institutions such as; education, healthcare, and religous organizations. Most radios approved for LMR usage operate on either VHF (150-174 MHz), or UHF (421-512 MHz) frequencies. Once obtained, the license is good for 10 years. Simplex License - Licenses a set of frequencies within a radius of a specified location. Duplex License - When using a repeater this license includes a frequency pair, spaced for repeater use. Itinerant License - Allows the use of radios at temporary locations within a state, set of states, or nation-wide. Commercial applications usually require frequent use of channels with minimal interference by outsiders. An FCC LMR license affords businesses relatively open communication with minimal interference. CB and MURS channels are often crowded. MURS is an unlicensed service for either business or personal use. Equipment has pre-set frequencies on 5 channels in the VHF 151 & 154 MHz range. Since it is open to everyone the lack of privacy and channel interference may be a problem in a business setting. MURS radios are limited to 2 watts or less, so your talk range is limited. Still, MURS can be a good option for some businesses such as small sites or temporary job sites. Your radio must be MURS certified to use MURS. Ham Radio is a popular passion among many people world wide. Is used by hobbiests and used in emergency situations by volunteers. Requires a licensed to operate communications equipment on the "amateur bands" (or frequencies). There are 3 types of licenses: Technician, General, Extra. You must pass an examination to obtain an Amateur radio license within the US (requires knowledge of radios and electronics). There are many online aids to help you prepare for the test. Once you have a license you can operate on many frequenices that are not available to other users. Does not require a license in the US. Can be used for either commercial or personal communications. Equipment has pre-set frequencies on 40 channels. Frequency range is 26.965 MHz (Ch 1) to 27.405 MHz (Ch 40). Marine radios are specifically designed for communications on the waterways. The channels on Marine radios have preassigned frequencies, each channel/frequency is designated for a particular type of marine communication. For example, channel 16 is set at frequency 156.800HMz and is for distress calls only. It is important that you only use two-way radios specifically approved for marine use when on the waterways. Other VHF radios should not be used because they will not have the proper frequency settings. Today's marine radios have other features such as NOAA weather alert channels. There are basically two types of marine radios: handheld and fixed-mount. Handheld marine radios are more limited in range, but can be moved from one boat to another. Fixed-Mount marine radios, just as the name implies are permanently mounted. They deliver more power as they are run off electrical connections on your boat. Airband radios are used for both navigation and communication. AirBand radios use VHF frequencies in the 108 MHz - 137 MHz range. No license is required for individuals. However, aircraft stations do require a license. See the FCC for more details. Use only airband radios for aviation. Aviation radios are not like other VHF radios. Airband radios have specific channel setups and functions used in aviation communications that land-based VHF radios do not have. Since aviation transmissions primarily occur in the air, communication range is much greater for airband radios than land-based VHF radios. So a 5 watt handheld airband radio used in-flight will have a much longer range than a similar 5 watt VHF land-based radio. Panel mounted airband radios, usually 8 watts, have an even greater range. From the air, most airband radios typically have a range of around 200 miles. COM channels Used for voice communication, US assigned frequencies between 118.000 MHz to 136.975 MHz. These frequencies are split into 200 narrow-band channels of 50kHZ each. NAV channels For navigational assistance, assigned frequencies from 108.000 MHz to 117.95 MHz. The common navigation system used in the US is 'VHF Omnidirectional Range' (VOR). VOR is a system of short-range radio beacons that help pilots determine their position and stay on course. VOR has become a global standard for air navigation, with approximately 3,000 VOR stations worldwide. NOAA Channels Today's airband radios typically have NOAA weather channels and provide NOAA weather alerts. Distress Channel Airband radios also have an emergency communication frequency (known as International Air Distress or IAD). It is assigned to 121.5 MHz. Handheld Looks much like a typical handheld land mobile radio. Panel Mount Mounted in the cockpit panel of the aircraft. Ground Communication Much like a land-based mobile radio, it operates on the ground, either mounted in a vehicle for ground crews, or sitting on a desk.